Chick-N-Joy has been serving loyal customers in Leslieville since 1977. Family-operated and owned by John Doufekas all these years, Chick-N-Joy is a true pillar in the community. Johnny, as he's known to his regular customers, is a master at his craft, and his craft just happens to be some darn good fried chicken. Chick-N-Joy used to offer "Famous Hamburgers" as they were known, as well as fish 'n chips - but a few years ago, Johnny suffered a heart attack. In an attempt to cut back on some of the work, he reduced the menu to focus on fried chicken. How much he's cut back I'd like to know; Johnny's day starts regularly at 5:30 in the morning and runs till 6:00 at night, and has for more than 30 years. And people still come in asking for a Famous Hamburger. It all starts with quality products and Johnny likes everything fresh and made by hand...usually his. If it's not him, it's likely to be his son, Bill, who's at the helm in the kitchen after 6:00 p.m. and on weekends with his sister at the counter. Maple Leaf delivers fresh, never frozen, chicken pieces every second day. Every night, Johnny's helper comes in at 9:00 p.m. and works for three hours to peel and cut potatoes for their signature fries. 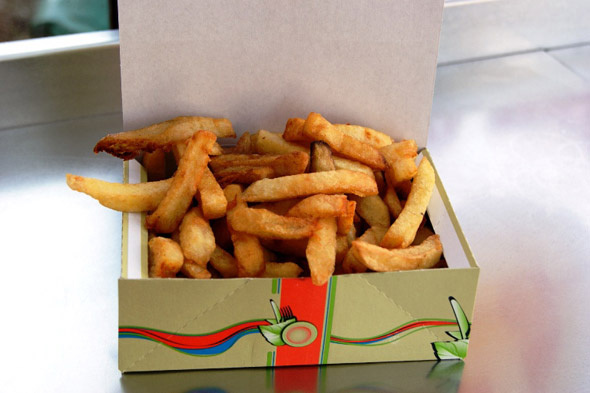 Each potato is inspected by hand to remove any dark spots or eyes, and these fries are a benchmark for fresh-cut. When I asked Johnny why he never expanded, opening other Chick-N-Joy restaurants, with accented conviction, he said, "Why not grow? Quality. With three, four stores, you start buying frozen. Frozen no!" There are many types of country fried chicken recipes and the Chick-N-Joy chicken is not the soaked in buttermilk, heavily battered, deep south version. I'd call this more of a commercial style of fried chicken akin to one of those other franchise places with the colonel or sailor. Theirs is lightly dusted so the crust is thinner and crispy in parts and the meat is succulent probably from pressure cooking which locks in the juices. On one occasion, I order their regular lunch special consisting of 2-piece with fries and a pop ($4.95). It's definitely a multiple napkin occasion as juices drip down my chin when I bite into a thigh piece. The white meat is similarly tender but not my preference. They don't supply wet-napkins but I know to bring my own now. Another time for a group, I might order the 9-piece meal deal, which includes large fries, salad, and a large gravy ($19.99). 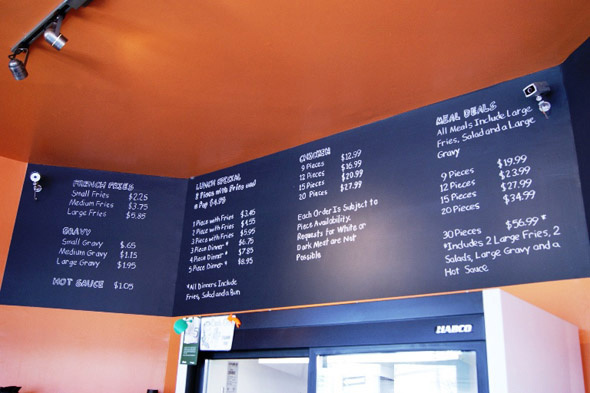 Chick-N-Joy offers several salad choices, all made on premises. 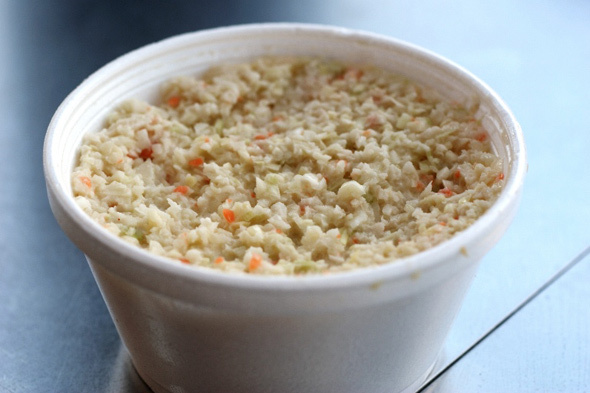 I like the coleslaw because it has the right combination of sweet to sour. It has a nice crunchy cabbage flavour and serves as as a palate cleanser between bites of chicken. Chick-N-Joy also offers potato salad, mixed bean salad and even hot sauce, again made by Johnny. The biggest point of contention is the bright yellow chicken gravy. Not out of a can as one might presume when looking at the colour, this gravy is the real deal. 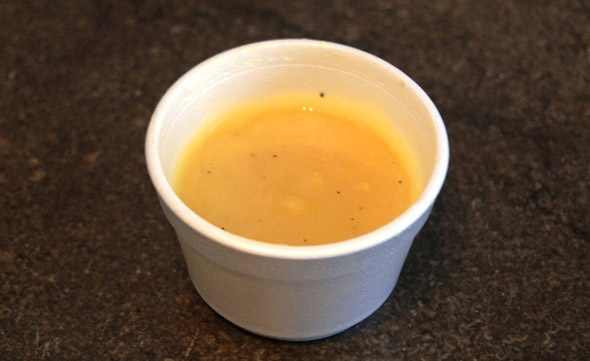 Made with corn flour, which gives it a neon yellow glow, the gravy is made two or three times a day depending on demand. 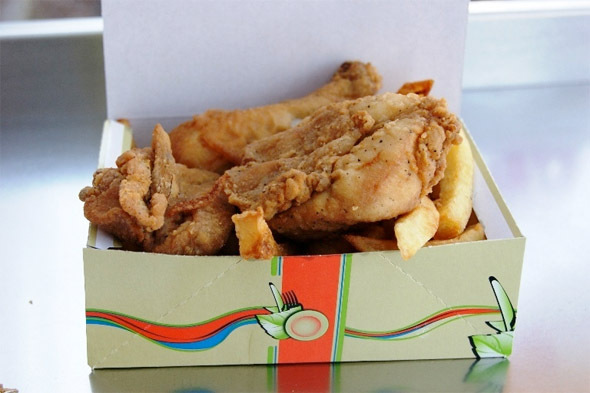 It's what many of the regulars - some of whom have been eating at Chick-N-Joy for the full 33 years - are addicted to. And there's good reason why. The gravy is delicious. It's not overly salted and it has a strong chicken base. "Two days ago, I have a sign that says the gravy is changed for a few days. I run out of corn flour so I have to substitute. One customer comes in, sees the sign and says 'What, no gravy? No chicken,' and he walks out," Johnny laughs as he recalls this. That's gravy loyalty. But he'll be back, when the yellow chicken gravy is ready. Last year, Chick-N-Joy renovated and the money was well spent. They closed for about five weeks and many people thought they had closed for good, despite the signs indicating a renovation. I'm glad that was just a rumour. For me, Chick-N-Joy really was "love at first bite." Writing and photography by Dawn Becker.